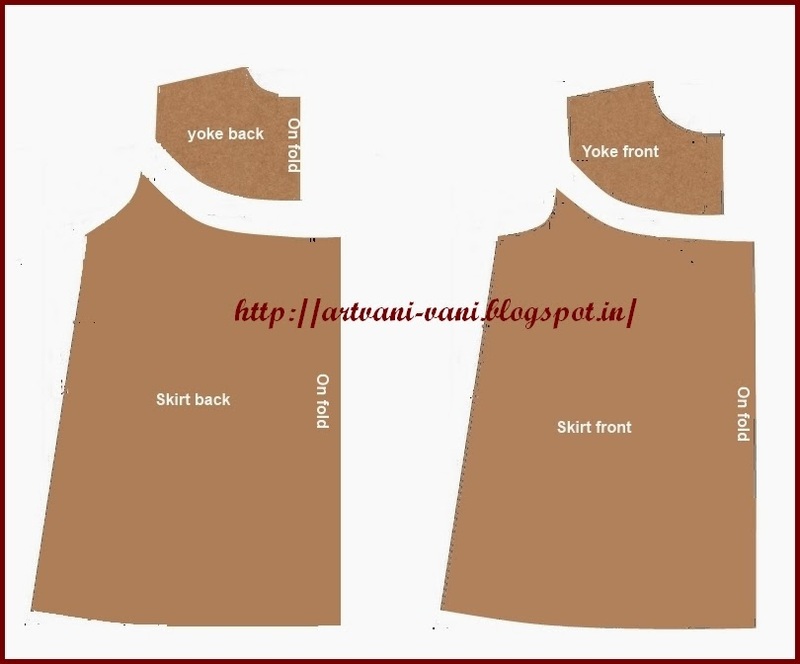 Draft of night dress with round yoke can be prepared by making a few additions to the draft of basic simple night dress. 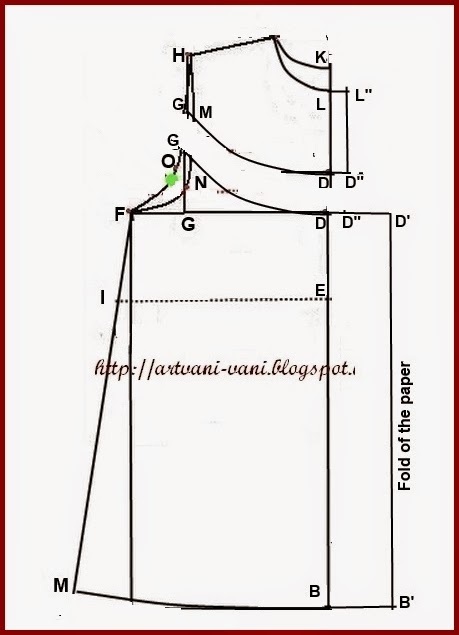 Take a folded sheet of paper and draw a parallel line X-Y, 6” away from the fold. Mark point A on the line X-Y. Prepare the draft of simple night dress as explained Here. Produce the line F-G-D let it meet the fold of the paper at D’. 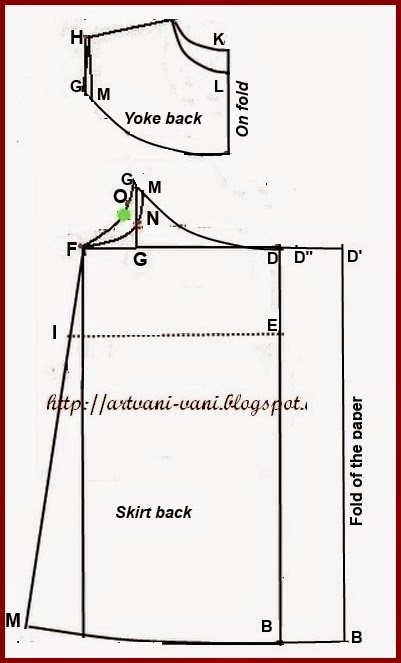 Draw a line L”-D” parallel to and 2” away from the line L-D.
G is the midpoint of the armhole line of the back. Join points G and D by a curved line as shown. 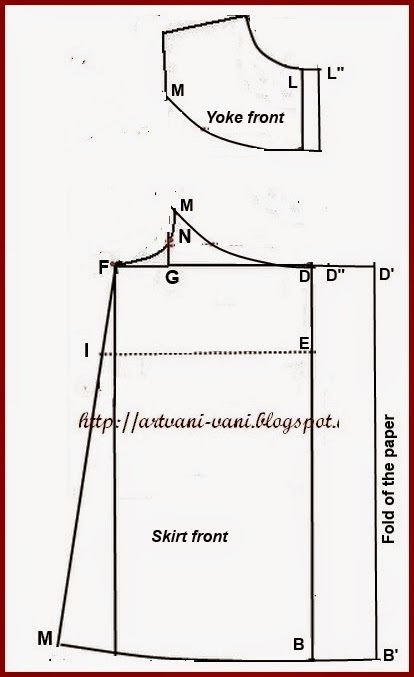 This curve intersects the armhole curve of the front at the point M.
Separate yoke from skirt by cutting along the curve G-M-D-D”D’. Keep the bottom layer aside .This is skirt back. From the top layer F-N-M. 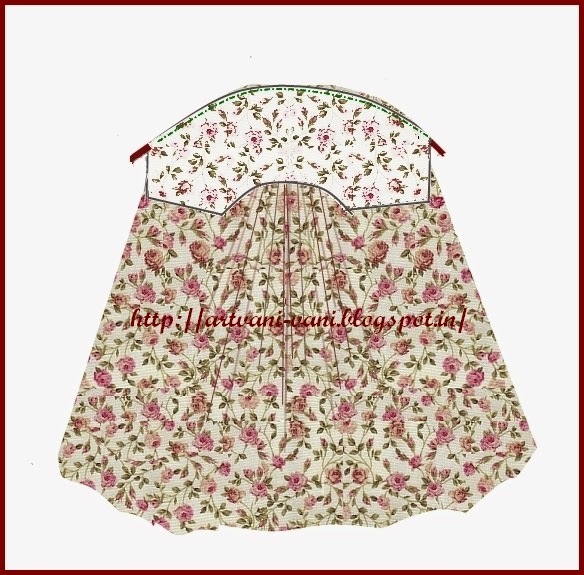 The remaining portion is skirt front. Yoke portion also has two layers. 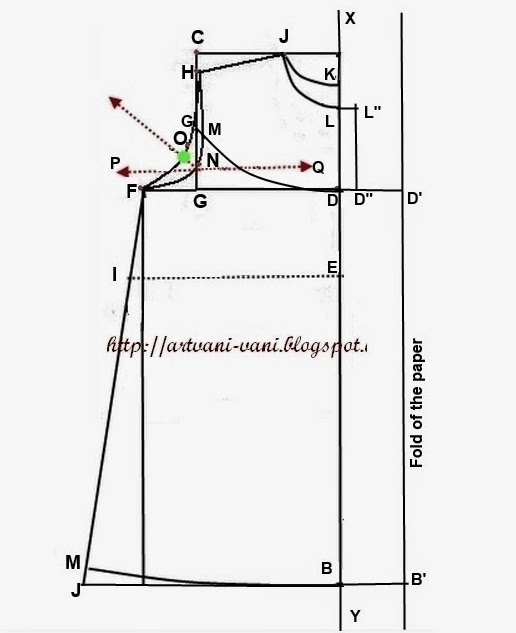 Fold and crease them together along the line L-D.
From the bottom layer cut along the crease and remove portion L-L”-D”-D.This is the yoke back. From the top layer cut along G-M-H. This is the yoke front.The extension L=L”-D-”D is for neck line placket. Place the paper pattern pieces on the fabric as shown in the layout cut the different pattern pieces.Add half an inch seem allowance as shown by dotted lines. 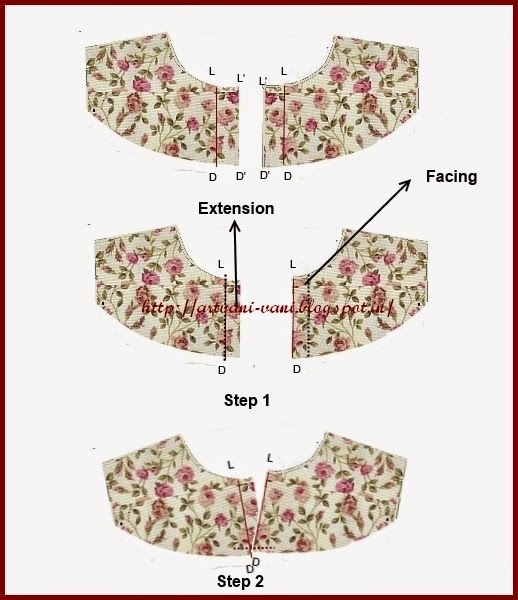 Stitch the neck line plackets as explained here. Here we have added extra material so we need not attach separate strips for plackets. 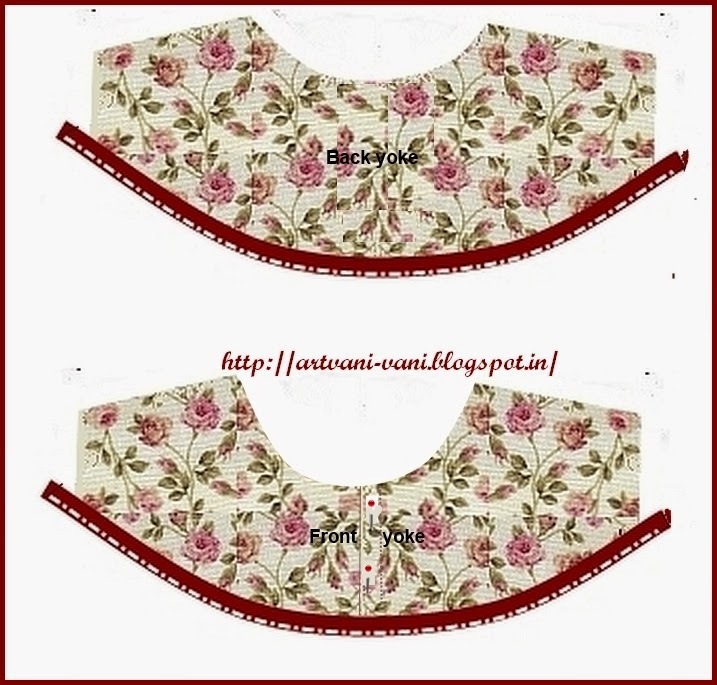 Place facing of the right back yoke on the extension of left back yoke and fix them with few stitches. Prepare bias tape of width 1½” from a material of contrast colour. .Fold the bias tape in to half lengthwise. Tack folded bias tape to the right side of the back yoke, keeping raw edges of bias tape and bottom curve of the yoke together. Place facing of the placket of the front yoke above the extension and secure them with pins.Tack the bias tape to the front yoke as explained earlier. 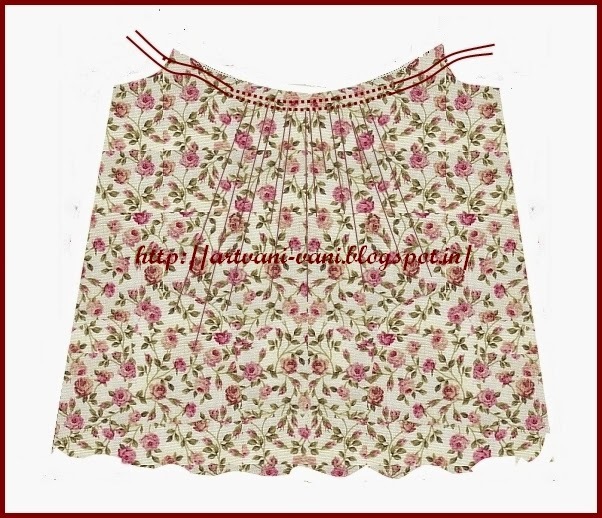 In the same way you can attach frills to the yoke. Run two rows of long stitches Gather the middle portion of the skirt front and skirt back by pulling the one end of 2 threads together, so that its width is equal to the width of the yoke. Keeping right sides together stitch front skirt to front yoke to front skirt and back yoke to back skirt sandwiching piping in between. 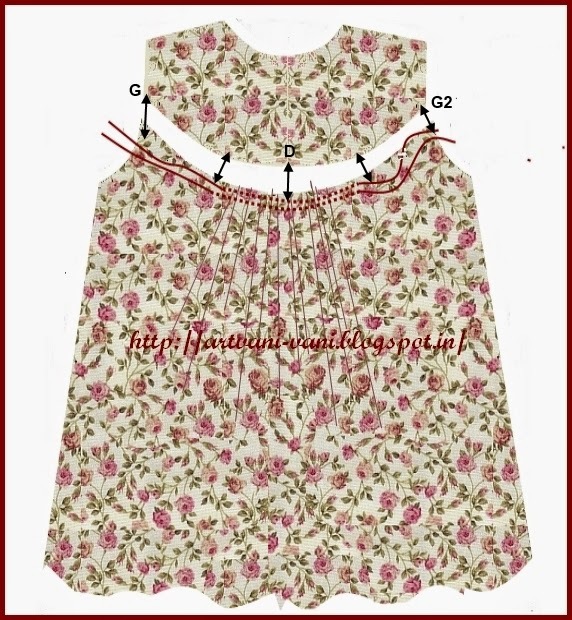 Join front portion to back by sewing along the shoulder lines. 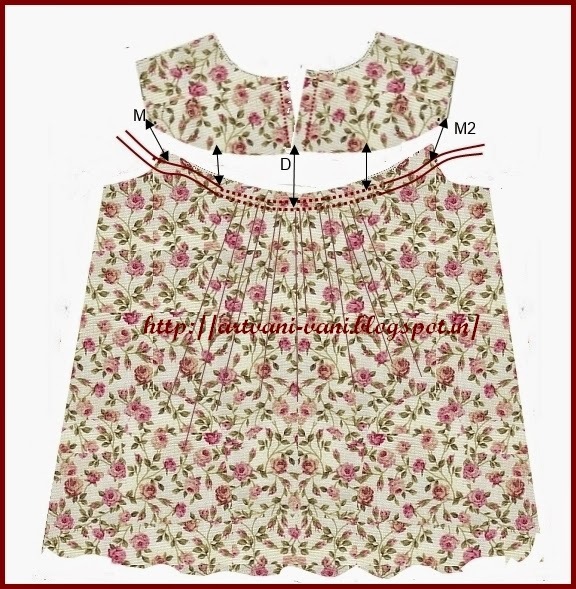 Finish the neckline and armhole with piping as explained here. Stitch sides and finish the hem . Stitch buttons. Night dress with round yoke is ready! Can we follow the same method for the nigtie as well.. Please can you eloborate on the method to stitch a yoke style nightie.. 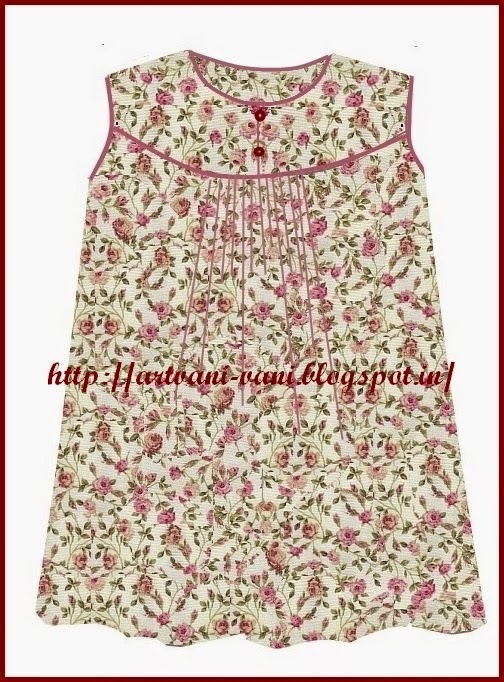 I stitched the simple nightie and it came out very well.. eagerly waiting for your reply! I have added few more images to make it clear.